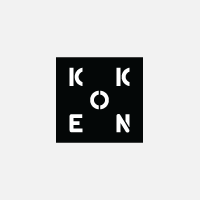 Browse, select and import Instagram images from inside Koken's Library. We've updated the original Instagram Import plugin with a new 1.5 version that makes image browsing, selecting and importing better than ever. The plugin now connects directly to Instagram's API and displays a scrollable list of all your latest images. Click on the images you want, hit Import, and the plugin takes care of the rest. Visually browse all your Instagram images, or copy/paste the image's page url from Instagram.com. The plugin will retrieve your chosen images and add them to the Koken Library. Along with the image itself, Instagram Import also retrieves titles and generates tags that match your Instagram hashtags so imported images may be grouped and browsed using the same tagging scheme you're using at Instagram. You can even clean up your Instagram titles by automatically removing hashtags as part of the import process. Imported Instagram images behave like any other Library image, so they may be grouped, mixed and sorted however you want. Group them all together, or mix with non-Instagram images for an album of images that incorporates everything you've shot. Instagram Import leverages Koken's Lens image template tags to ensure compatibility with any theme. That means you can start importing and publishing Instagram images to your site today without any modifications to your current theme. Follow these steps to setup the Instagram Import plugin. Connects Koken with your Instagram account. Click Connect to authenticate. Once authenticated a Disconnect button will be made available here to revoke priveledges thereafter. (Default: Off) This will assign an #instagram tag to every image imported from Instagram. Handy for viewing all imported Instagram images on your site. (Default: On) Copies the full Instagram image's title and assigns it as the imported image's title. (Default: Off) Many Instagram users include hashtags at the end of their titles when posting images. This option detects those hashtags, creates new Koken tags to match, then assigns the tags to the imported image. This allows your imported images to maintain the same tagging criteria used at Instagram. (Default: Off) Removes all hashtags from the Instagram title. We only recommend using this if you append hashtags to the end of your titles. Time to import some images! Click Import content at the bottom right of the Library, then click the Instagram button. If you haven't already connected Koken with your Instagram account a Connect button will appear. Click the button to shake hands. Once authorized you'll see thumbnails of all the images you've uploaded to Instagram. Scroll and single-click on the images you want, then press Import. Koken will retrieve the image(s) and add them to your Library. You may also import images by url. To do so, head over to Instagram.com in a separate browser window, view your profile page, then click on any thumbnail. A lightbox containing the image will display. Copy the url that appears in your browser's location bar, as illustrated below. Return to Koken and click the page url link above the thumbnails. Click inside the Instagram URL field and paste the url from your clipboard. Click the Import button and you're done. Click Instagram imports in the left column of the Library to see only the images you've imported from Instagram. Feel free to drag images from here to Favorites, Featured content, or any album in the left column. Instagram images look, feel and function like any other image in the Koken Library. You may assign tags, categories, captions, as well as group images together using albums. Import an image from Instagram and it will immediately appear on your web site's content and timeline pages. Regardless of when the image was posted to Instagram it will be treated as "new" and published to the top of these calendar-based templates. The date the image was originally posted to Instagram is assigned to the image's Captured date. If you want an Instagram image to be published on the day it was posted to Instagram, select the image in the Library, edit Published in the right column, then check the Assign date captured option. The image will then appear on your site using the same date from Instagram. If you always want your imported images to be published using the Instagram date, go to Settings > Importing in Koken and check the Assign date captured to date published option. Instagram images are handled like any other image, so if you'd like to publish an album of them, click the plus (+) button at the bottom left of the Library. Create an album, then click on Instagram imports in the left column. Drag images from here onto the album you just added in the left column. Once created the album will appear on your site's Albums index page. You may also add the album to your site's navigation by clicking on Add links in the left column of Site. Click Add, then name the page. You may also fine-tune the page display options underneath. Koken will duplicate your theme's Contents template and display all your Instagram images sorted by recency. If images from Instagram are part of your Koken Library and the Instagram Import plugin is disabled, all previously imported images will remain in the Library and on your published site. The plugin will need to be re-enabled in order to import Instagram images again. Legal Instagram is a registered trademark of Instagram, LLC which is not affiliated with this product. Fixes issue displaying photos in Library. Progress notifications when connecting to Instagram. Fixes related to Koken 0.17. Updates for new visibility changes in Koken 0.14. Instagram import option now shows properly in the insert media sheet for essays and pages. Plugin has been completely rebuilt to connect directly to your Instagram account. 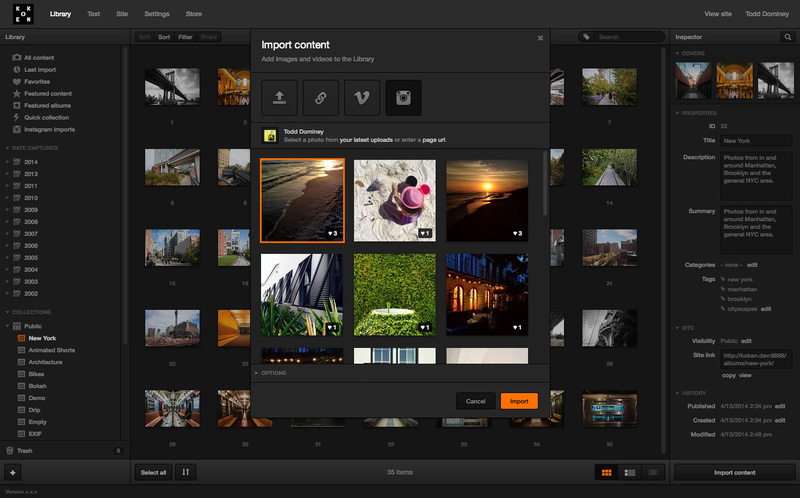 You can now preview and import your images right from the "Import content" sheet. Filtered template for displaying just your Instagram content in any theme.